Reference number for this case: 21-Oct-54-Guengat. Thank you for including this reference number in any correspondence with me regarding this case. 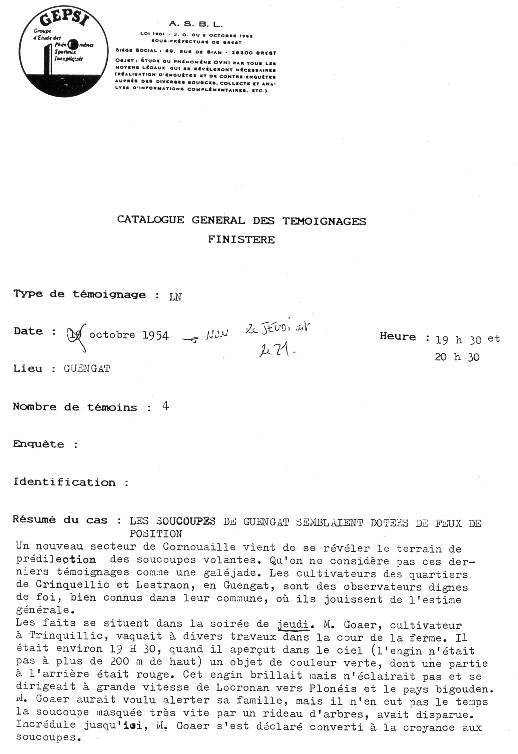 They noted that on October 21, 1954, at 07:30 p.m. and 08:30 p.m., in Guengat, in the Finistère, farmers of the Crinquellic and Lestraon neighborhoods, who "are reliable observers, well known in their commune, where they enjoy the general esteem" said they saw flying saucers. In this case, a Mr. Goaer, farmer in Trinquillivic, went to various jobs in the farmyard, when around 07:30 p.m. he saw in the sky, at no more than 200 meters in altitude, an object, green in color, red at the back. "This machine shone but did not light and was moving at high speed from Locronan to Ploneis and the Bigouden country." Mr. Goaer wanted to alert his family, but he did not have time: the "saucer" was "masked very quickly by a row of trees", and "had disappeared." "Incredulous so far, Mr. Goaer declared himself converted to saucer belief." Time: 07:30 P.M. and 09:30 P.M.
A new sector of Cornouailles has just appeared as the ground of choice of the flying saucers. Let it not be thought that these last testimonies are yada yada. The farmers of the districts of Crinquellic and Lestraon, in Guengat, are worthy of faith observers, well-known in their community, where they enjoy the general consideration. The facts happened in the evening of Thursday. Mr. Goaer, farmer in Trinquillivic, was occupied with various tasks in the farmyard. It was approximately 07:30 P.M. when he saw (the machine was not at more than 200 meters in height) an object of green color in the sky, of which a part at the back was of red color. This machine shone but did not illuminate and moved at high speed from Locronan towards Plonéis and the bigouden country. Mr. Goaer would have liked to alert his family, but he did not have of it time the saucer masked very quickly by a curtain of trees, had disappeared. Nonbeliever up to now, Mr. Goaer declared that he converted to the belief in the saucers. Insufficient information, probably the 07:15 p.m. meteor of that day. 0.1 Patrick Gross January 16, 2004 First published. 1.1 Patrick Gross December 31, 2018 Addition of the Summary, Explanations changed, were "Not looked for yet."